3.1-Megawatt System on Staten Island to Provide Electricity for Fordham University and Fordham Prep. New York, NY - July 18, 2018 - The New York State Energy Research and Development Authority (NYSERDA) today announced the completion of the largest solar system installed in New York City in Staten Island. The 3.1-megawatt solar array will offset a large portion of the electricity used by Fordham University and Fordham Preparatory School in the Bronx, supporting Governor Andrew M. Cuomo’s nation-leading clean energy goal mandating 50 percent of electricity to come from renewable energy sources by 2030. The announcement was made today at a ribbon-cutting ceremony in Staten Island. The solar array is comprised of more than 9,000 solar panels and will generate nearly four million kilowatt hours of clean solar energy each year, enough to offset 20 percent of Fordham University’s electricity use and 37 percent of Fordham Preparatory School’s use. The ground mounted system was installed on approximately 10 acres of unused industrial property in Staten Island. The solar project uses an arrangement known as remote net metering. Under this arrangement, solar that is installed at one site can offset electric bills for customers at different locations. 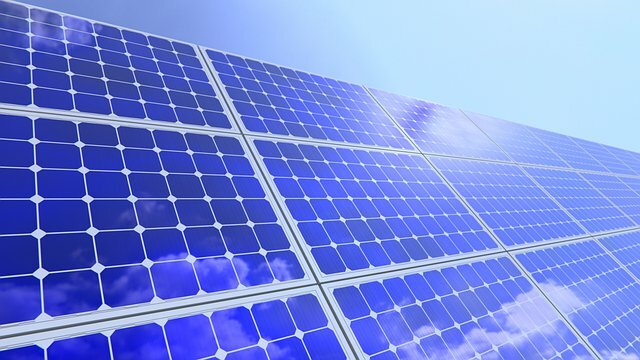 With the continued cost declines associated with solar energy, the state is committed to ensuring that the policies and regulations that compensate solar production do so in a way that benefits all electric customers while also benefiting the electric grid and delivering the biggest bang for the buck when it comes to reducing carbon emissions. "This new solar installation reflects Fordham University's ongoing commitment to sustainability and the environment. We were very pleased to be able to partner with Governor Cuomo’s initiative, Reforming the Energy Vision (REV) for New York," said Marco A. Valera, Vice President for Facilities Management at Fordham University. "In addition to the Staten Island solar array, which will provide 2.6 Megawatt of solar power to the University, we have entered into an agreement with EnterSolar to install a new solar array of approximately 1 Megawatt on the roof our parking facility at our Rose Hill, Bronx, campus. This makes Fordham a leader in solar power both in the state and in the City of New York." President of Fordham Preparatory School, Rev. Christopher J. Devron, SJ, said, “Fordham Prep is pleased to be a partner as this project advances Fordham Prep's mission by striving for a sustainable environment and teaches our students to be responsible stewards of our natural resources. As a Catholic Jesuit school this partnership helps us answer the call issued by Pope Francis, who invites us to protect the global environment because it is sacred, both for its own God-given value and for the life and dignity of all humankind." Governor Cuomo’s $1 billion NY-Sun initiative provided funding for the project. NY-Sun is designed to scale-up solar across the state and move the state closer to a robust and sustainable market for solar energy. Since 2011, solar in New York State has increased more than 1,000 percent and leveraged more than $2.8 billion in private investments. There are more than 12,000 people engaged in solar jobs across New York. Through private and public partnerships, New York has been successfully reducing the state’s carbon footprint by increasing the number of renewable energy sources statewide. As a cornerstone of Governor Cuomo’s clean energy and climate agenda, ensuring that all New Yorkers benefit from the clean air and economic development benefits of renewable energy resources will be essential as the state transitions to a more resilient, cost effective and modern energy system. The system was designed, developed and installed by New York City-based EnterSolar. Key Equipment Finance, an affiliate of KeyCorp and one of the largest bank-based equipment finance providers in the country, provided financing for the project, which was also supported by Consolidated Edison, Inc.
Reforming the Energy Vision is Governor Andrew M. Cuomo's strategy to lead on climate change and grow New York's economy. REV is building a cleaner, more resilient and affordable energy system for all New Yorkers by stimulating investment in clean technologies like solar, wind, and energy efficiency and requiring 50 percent of the state's electricity needs from renewable energy by 2030. Already, REV has driven growth of more than 1,000 percent in the statewide solar market, improved energy affordability for 1.65 million low-income customers, and created thousands of jobs in manufacturing, engineering, and other clean tech sectors. REV is ensuring New York reduces statewide greenhouse gas emissions 40 percent by 2030 and achieves the internationally recognized target of reducing emissions 80 percent by 2050. To learn more about REV, including the Governor's $5 billion investment in clean energy technology and innovation, visit rev.ny.gov. Subject: LongIsland.com - Your Name sent you Article details of "NYSERDA Announces Completion of Largest Solar Installation in New York City"